Some time ago one of my father's business friends called me, asking if I could tutor his 13 year old daughter in maths. She was lagging behind everyone else in the class, he said. 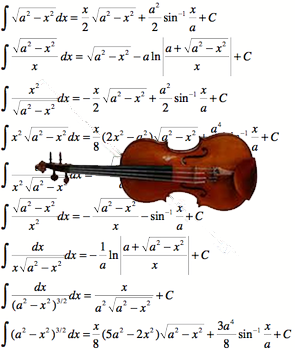 I explained to him that I only taught violin, not mathematics. Although I'd taken it at university for a couple of years and still had an intermittent interest, I suggested he would be better off with an experienced maths tutor. Nevertheless he persisted, so I reluctantly agreed to give it a go. Carly was a conscientious student who'd lost confidence due to a string of poor test results. I wrote out for her a few problems similar to the ones she'd had trouble with. While there was little wrong with comprehension, some of her processes and calculations revealed some basic errors. Unsure what to do, I started from scratch, systematically going through the multiplication tables with her until we discovered a few uncertain areas. After a bit of work on these, I set some Kumon-like repetitive homework on these tables to be practised daily - violin style. Carly got the idea and practised every day. At our next session the mistakes caused by multiplication were gone, so we moved on to the next source of errors - long division. Each week thereafter we continued on like this, adding more fundamental skills and processes to be practised along with the others. During the next four or five weeks she fixed everything and I marvelled how quick it had been. It got me thinking. I'd seen how Carly's maths textbooks focused mainly on problem-solving and comprehension exercises. Essentially it required translating questions and problems into mathematical forms before carrying out the calculations. This was fine, but there was less emphasis on fluency in the processes and calculations themselves, and it was hard for students to identify what skills they needed to practise to perfection. Also, at school it was normal for a proportion of the class to continually make mistakes of one kind or another - despite lessons moving on to new mathematical areas. Only a handful ever got 100%. Musicians wouldn't (or shouldn't) study this way. As you know, we build ability by practising a skill, technique, passage or piece over and over correctly until it is a part of us. Then we try to solve the problem of how to interpret and communicate the music. It showed me again, as if I needed persuading, the value and benefits of studying violin. It teaches you how to learn. Carly's remarkable turnaround showed the folly of leaping into concepts of creative thinking and problem solving, without completing the task of building real skill and ability through simple practice. In today's world of superficial, "fast" learning for grades, trophies, and shallow recognition, too many forget that there can be no CREATIVE thinking of value without CRITICAL thinking, which is developed through exposure, analysis, mindful repetition, self-reflection, persistence, and grit. Wow, John. I don't know about 30 years ago, but those integrals look pretty fearsome to me now! Reminds me of a lovely cartoon I saw in the Times Educational Supplement around the '60s/'70s: A bird is saying to her offspring, "I'm sorry, chicks, discovery methods are in. From now on,you find your own worms".